I get excited when I come across a new-to-me Island-based business or initiative, so last week I was thrilled to learn about Faires Farms just outside of Parksville. Based on the increasingly popular SPIN method – otherwise known as Small Plot INtensive – Faires Farms provides area residents with fresh, local produce they might not otherwise have access to. 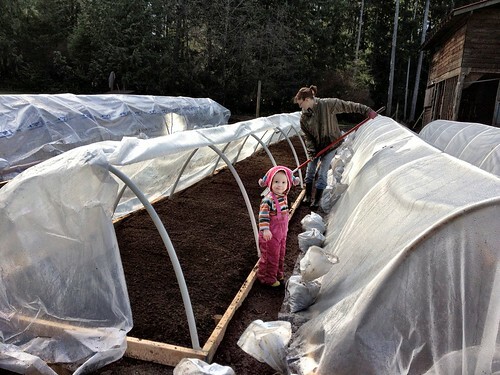 This sustainable method makes use of unwanted lots or unused backyards, so Faires Farms is able to keep costs low while making exceptional use of the rich Island soil. 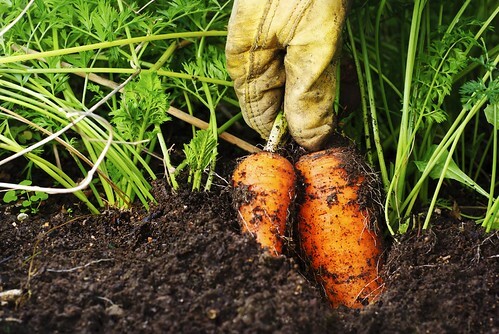 All garden beds within the Faires Farms family are Certified Naturally Grown, meaning that they follow the strictest organic standards and take extreme sustainability measures. This includes using no-till methods, permaculture techniques, rainwater collection, and sourcing their soil inputs from the Island’s own bioregion. Nicole calls it an alternative to organic certification that’s run by farmers and without the politics. You can find Faires Farms’ fresh produce at the Qualicum Beach Farmers Market between spring and fall or sign up for their weekly delivery service. Delivery is available in family size or a personal bag (great for one or two people) and guarantees 8 – 10 different items each week. The delivery boxes include a newsletter, a big bag of mixed baby greens, a big bunch of carrots and 6-8 other popular things such as tomatoes, potatoes, kohlrabi, radishes, broccoli, basil and more. When it’s in season, Faires Farms also sources locally grown organic fruit. Faires Farms currently delivers to Parksville, Qualicum Beach, Port Alberni, Lantzville, Nanoose Bay and Nanaimo. They hope to soon expand the delivery service to the Comox Valley and Campbell River once the interest grows. For more information on Faires Farms, please visit them online. You can also find Faires Farms on Facebook or follow along with Nicole on Twitter. I am trying to get info from your site but am unable to access you page. Info on sizes and prices would be appreciated. Hi, read your article. I have a 600 sq foot greenhouse (plastic) that you can use. Fourneau Way Parksville. 250-927-0257. It is clean and ready to go. If you are interested I can send pics. Anne O’Sullivan. My website is just for reference. I want to buy the bus you were selling. Is it sold?